The work of convict architect Francis Greenway is characterized by a range of motifs used with great variety across a range of projects. Greenway incorporated his characteristic hemispherical domes into several projects – over stairhalls at Ultimo House (1814, demolished 1902) and Supreme Court (1820-27). The Macquarie Lighthouse, South Head (1819, demolished 1883) was designed with a pair of domes over linked pavilions. 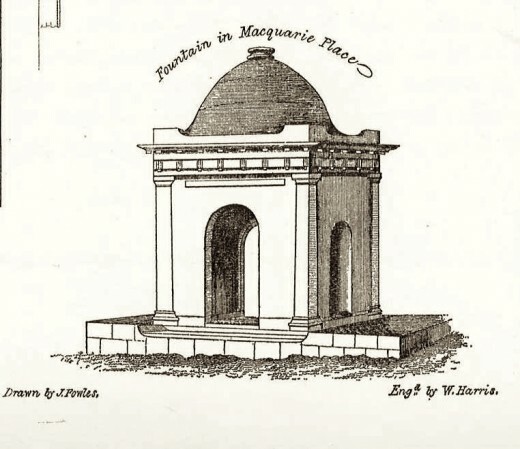 The dome of the fountain, Macquarie Place (c1817, demolished c1882), featured a dome (altered by the 1840s) which emerged from a shaped blocking course or parapet, like that of the Hyde Park Barracks guard houses. 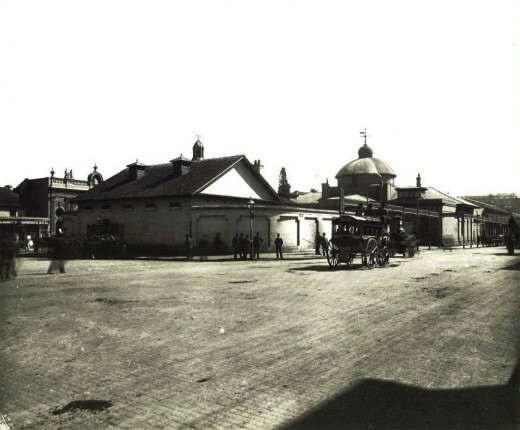 The cruciform Sydney Market (1820, demolished c1890) featured a dome at the crossing. Greenway designed his domes – overhanging hemispherical forms supported on a drum – as self-conciously stripped back elemental forms, a ‘primitive’ tendency favoured by Regency architects such as Sir John Soane which was possibly ultimately inspired by the writings of the philosopher, Jean-Jacques Rousseau. The domes were constructed of curved timber ribs, braced with substantial hardwood circular plates and covered with Forest oak (Casuarina torulosa) shingles overlaid on narrow battens. The guardhouse drums were also supported on a circular timber (Eucalyptus sp) base plate. One of these, recently discovered beneath the floor of the adjacent Mint building (see Gary Crockett’s recent post in this blog), will be re-incorporated in the northern guardhouse, whose above ground archaeology will be interpreted. Architectural historian, James Broadbent identified John Plaw’s Ferme Ornée or Rural Improvements (London, 1795) as the design source for a barn and stables at John Macarthur’s Home Farm at Camden Park. While the same design was used for stables at nearby Brownlow Hill c1830, there appears to be no evidence of Plaw’s publications being used by the Macquaries or Greenway. 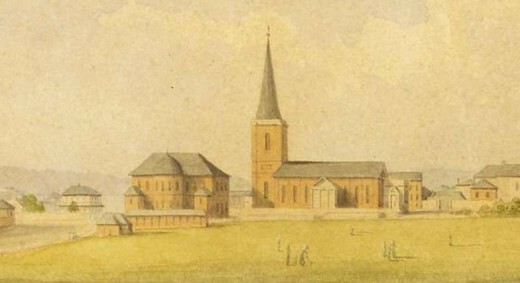 The Plaw design used at Camden originated with either Greenway’s rival, Henry Kitchen (1793-1822, active in NSW from 1816) or John Macarthur, who returned to the colony in 1817. Plaw’s design for a hunting box with twin lodges does not appear to have direct bearing on Greenway’s design for the Hyde Park Barracks, constructed in 1817-19. A similarly interesting parallel is the Workhouse, Southwell, Nottinghamshire, England (1824), a three storey barracks set within a compound which was compartmentalized according to the genders and classes of the inmates. In 1800 Greenway, in exhibiting drawings at the Royal Academy, London, gave his address as ‘At Mr Nash’s’ and giving rise to the hypothesis that Greenway, born into a family of Bristol builders and stonemasons, had been drawn into the architect’s John Nash’s sphere during his years of ‘exile’ in Carmarthen, Wales during the 1790s. Greenway designed and built a market house at Carmarthen, Wales in 1801, a commission he may have secured through Nash. Greenway presented a design for the Carmarthen market house to Macquarie in 1814 by way of demonstrating his credentials as an architect, although the design may have been more sophisticated than the completed building. – The Warrens, Brayshaw, Hampshire, 1800-02. Australian colonial architecture may generally be seen as provincial as the architecture of Greenway’s native Bristol. However, Greenway’s architectural competence and association with John Nash (later the Prince Regent’s architect and the architect who recast Regency London in classical garb) lifted him above many of his peers in Sydney or the English provinces. His shingle-clad Hyde Park Barracks guardhouse domes in their ‘primitive’ simplicity gave Governor Macquarie’s principal Sydney street a metropolitan sophistication. Hyde Park Barracks Domes Restoration Project is powered by	WordPress 4.7.13 and delivered to you in 0.489 seconds using 32 queries.